By Moorlands. Approximately size 8. The brown suede uppers are really quite good but after that it isn't good news! The rubber “galosh” section is partly missing and what remains is perishing with substantial crystalization and cracking. 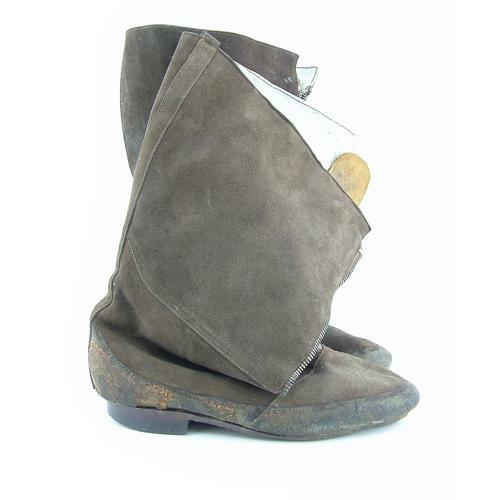 The soles and heels are also heavily worn and substantial parts of the linings are missing. The left boot retains a decent original early D-o-T zip but the right boot zip lacks a slider. Moorlands label and faint Air Ministry marks on the zip tongues. Sold as a very cheap display pair or the zips/zip tongues could be stripped out for spares. Priced accordingly. Stock code BFVH.